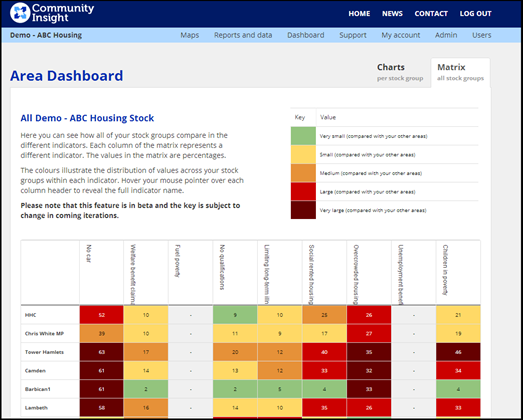 The last year has seen Community Insight become the most used new data analytic tool in the housing sector, with more than 50 housing providers with a total of 1m homes in management using it regularly access and analyse data on the communities that they work in. The size of that user community has allowed Community Insight to accelerate development of new features, enabling access to new data sets and new ways of presenting and interpreting data. In recent weeks, we’ve seen the integration of data from www.police.uk, providing at a glance access to the latest crime stats for individual neighbourhoods; the introduction of the “My Patch” facility, which enables housing providers to find out instantly who else is working in or near their neighbourhoods; and the ability to capture and export Community Insight data into other systems (including in house GIS and mapping products); as well as a host of behind the scenes changes to make Community Insight even faster and more robust. Over the next few weeks we’ll be rolling out more upgrades to what Community Insight can do. Users can already get a preview of the new Neighbourhood Dashboard feature at our beta site http://beta.communityinsight.org and comment on our LinkedIn Group. We’ll also see even more new data – integrating the live data feeds only recently made available from the Land Registry – and improvements to reporting, enabling the archiving of historic community profiles and the ability to “freeze frame” data and analyse trends. And – early in the new year – Community Insight subscribers will have an exclusive first opportunity to beta test our new social impact mapping tool, Value Insight, a partner application to Community Insight, which will enable housing providers to map and analyse the social impact of their community investment activities, drawing on exclusive wellbeing valuation metrics from leading social value expert Daniel Fujiwara, working in partnership with HACT. It’s an exciting time for Community Insight – if you’re a subscriber, get involved in the conversations around where we go next on our LinkedIn user group or come along to our active user group events (the next one is on 19 November); if you’d like to find out more about how Community Insight can make a difference to your work, register for a free demonstration and trial account here.